Feel like downloading a new game for your Mac? Maybe you’d like to try a cutting-edge first-person shooting game or a sophisticated adventure game, or perhaps you want to build and conquer civilizations. Apple makes it easy to download the latest in game applications from the App Store. 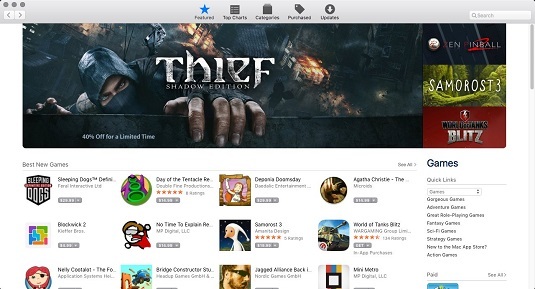 If you’ve used the App Store on your iPhone or iPad (or if you’re familiar with the iTunes Store within iTunes), you’ve sailed into familiar waters. You can download both commercial games (those that you buy) and free games for your Mac, and the App Store makes it easy to keep all your downloaded applications updated. Many other types of applications are also available from the App Store, including productivity, utility, and financial programs. Feel free to browse! Click the App Store button on the Dock (it’s a blue circle with an A). Click the Categories icon on the toolbar at the top of the window and then click Games. Click a game to display information about the game, such as the age rating, the size of the game, and representative screen shots. To download the game, click the price button in the top-left corner of the App Store window. Many games are free, and they display a button marked Free. The button changes to read either Buy App (for a purchase) or Install App. Click the button again to continue. The App Store prompts you for your Apple ID and password. Enter your Apple ID and password, and then click the Sign In button. The game begins to download. If you didn’t create an Apple ID (also called an iCloud account) during El Capitan setup — or if you don’t already have one for use with your iPhone, iPod touch, or iPad — click the Create Apple ID button. The App Store leads you through the process. When the download is complete, the game appears in Launchpad, ready for you to play.